Leaving aside a few celebrity vocal recitals, the world of classical music is pretty far behind when it comes to the Concept Album, and it’s all but unheard of to have one put out by a choir. 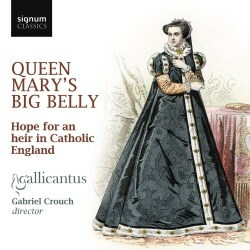 However, “concept album” is a pretty good description of Gallicantus’ Queen Mary’s Big Belly. They take a sequence of music - some of which, they admit, was not contemporary with Mary Tudor’s reign - and they use it to reflect on the events surrounding Queen Mary’s false pregnancy of 1555. Together with her husband, King Philip II of Spain, the Catholic Queen had made it her business to reverse the Protestant reforms of the reign of her brother, Edward VI; but all of her efforts would come to naught if she could not produce an heir. English Catholics rejoiced, therefore, when a pregnancy was announced in 1554-5. The Queen even went so far as her formal “lying-in” at Hampton Court in April 1555, the period which preceded labour. However, the summer came and went, and no baby was produced. Eventually, Mary died in 1558 and was replaced by her half-sister who because Queen Elizabeth I, and who then set about reversing Mary's Catholic reforms, as English Catholics had feared. It is this sequence of events that Gallicantus chooses in order to present a very well-curated collection of music. You may or may not be convinced by the concept, but you'll certainly enjoy the music, because it is performed beautifully, and there are lots of fresh discoveries on offer. Thomas Tallis features frequently on the disc, and you get some of the familiar church music, O Sacrum Convivium sounding fresh and transparent when sung by a group of this size; and his influence on the Sarum Litany lends its polyphonic sections extra intimacy and beauty. However, you’ll also hear some of his secular madrigals, which are a revelation. Like as the doleful dove is a beautifully limpid love song, while When shall may sorrowful sighing slack is a lament to accompany Mary’s (ultimately fruitless) lying-in at Hampton Court. The other name well-known in English polyphony is that of John Sheppard, whose polyphony rings out with brilliant clarity in his motets, two of which are written for feast days that would have preceded the Queen’s intended date of delivery, and both of which have Marian connotations. There are also secular ditties that would have acquired a connection with religion or with piety in general, such as the Ballad of the Marigold, which commends the virtue of the flower as a parallel to the queen’s. There is an important instrumental element to the disc, too, most especially when Elizabeth Kenny takes up her lute, either to accompany a singer or, in the case of Anthony Newman’s Fansye, to a play a beguiling free instrumental fantasia. If I began to lose touch with the justifications for the programme towards the end - and began incorrectly imagining why each piece had been chosen - then that doesn’t diminish the extent to which I enjoyed the music. Gallicantus are singers of the highest order and, concept or no concept, we should be grateful to them for creating a programme of such wonderful music and drawing it to our attention. The acoustic also suits them down to the ground, providing space around the sound and a beautiful bloom that suits it down to the ground. Full texts and translations are included, as is a scholarly essay on the period and the choices of music.